Its a mom! It's a maid! It's a cook! It's a nanny! No! It's super J!!!!! And what is her super power? Helping! Complete with a "La La" cape she goes about the house finding anything she can to help. 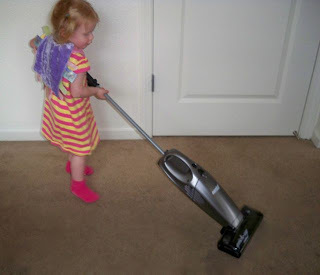 She loves to vacuum, fold laundry, throw things away for us, cook, and take care of the baby! Yesterday she spent about 15 minutes vacuuming, it was just too cute to watch her work so hard and she really did a very good job!